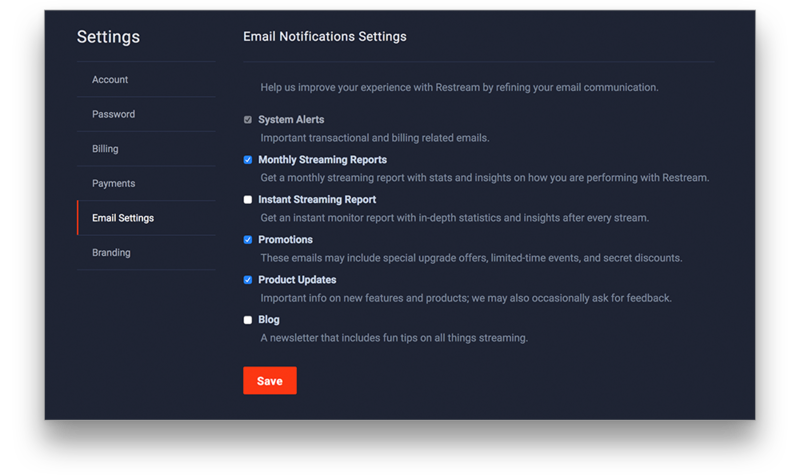 How do you change what emails you get from Restream? If you'd like to change what we send to you without unsubscribing to every Restream email, we've got you covered! From your account settings, you can fine tune what emails you will receive from us. System Alerts (Required) - Important transaction and billing related emails only. Monthly Streaming Reports - Get a monthly streaming report with statistics and insights on how you are performing with Restream. Instant Streaming Report - Get an instant monitor report with in-depth statistics and insights after every stream. Promotions - These emails may include special upgrade offers, limited-time events, and secret discounts. Product Updates - Important info on new features and products; we may also occasionally ask for feedback. Blog - A newsletter that includes fun tips on all things streaming. If you'd like to edit what emails you will receive from Restream, please click this link and uncheck the emails you would like to no longer receive and click "Save." You will now no longer receive emails from any of the disabled categories. You can follow these same steps to enable any email categories. Notice: If you would like to change the email we deliver to, please contact us through our live chat, and we can help get that changed.